-The diaper is free of inks, lotions, and chemicals. -The diaper is all white so you aren't paying for character licensing fees. -The diaper held up well to my heavy wetter. (Seriously my kid eats like a horse, so his wet diapers are always super soaked) No leaks. -The diaper held up well to a dirty diaper. (TMI: A soft one) No leaks. -The dry texture of the diaper could be off putting to some people, but it didn't bother me. -The price. The price is higher for less quantity of diaper, but you are paying a slight premium to not have your baby touched by chemicals all day. This diaper, in my opinion, would be the second best option to cloth if you could afford it. A 66-pack runs $27.99. The equivalent in Pampers runs $23.49. If I had the extra money to spend, I wouldn't mind spending it on a chemical free diaper. 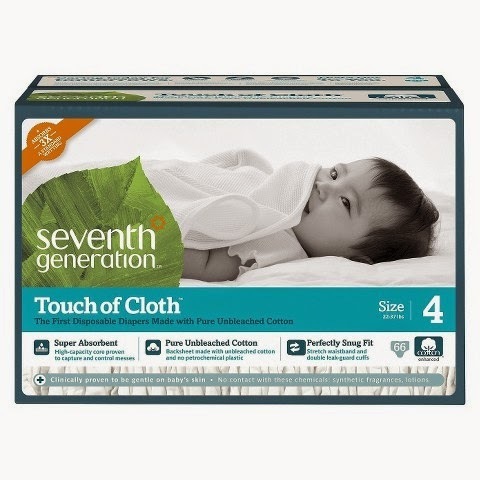 Seventh Generation Touch of Cloth Diapers are a great alternative when you're out on the road and cloth diapers are a hassle. I still love my cloth diapers, but I do disposables when I'm out for convenience. The price is a bit steeper, but it's really worth it.